When I went on long service leave in 2014 I was determined not to fall behind on my travel write-ups afterwards. Well, despite my best intentions, life got the better of me and I failed resoundingly. As you’d imagine, as more time passes, it gets increasingly difficult to remember details and write the blog posts, even if I’ve taken notes. 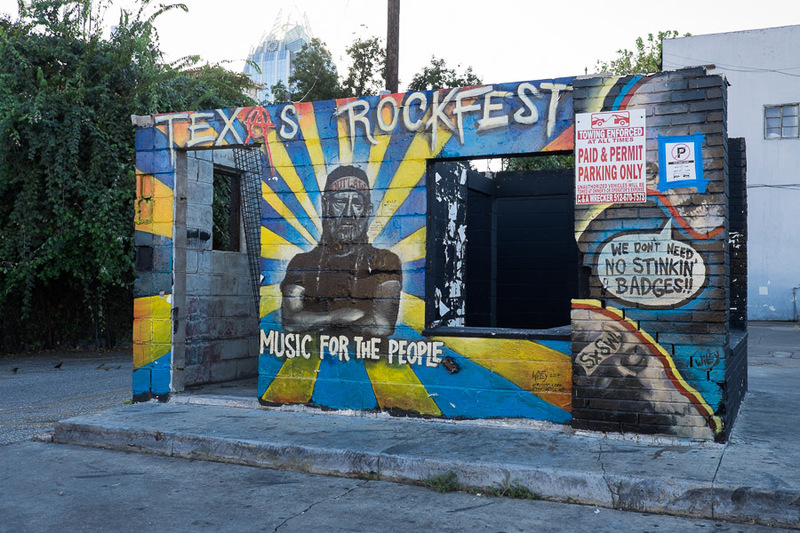 It is tempting to leave all those photographs and stories behind, buried in my memory and sitting on hard drives, but how could I not share the highlights from Austin, Texas? Jac and I had a great time in Austin. Hawaii was wonderful, but on this leg of the trip we met one of my internet friends Melinda and her family in person for the first time. I’m not going to get all mushy here, but over my 10+ years of blogging, I’ve made genuine friends all over the world, and it’s fantastic to have the opportunity to actually meet up and hang out – you know, like friends do. 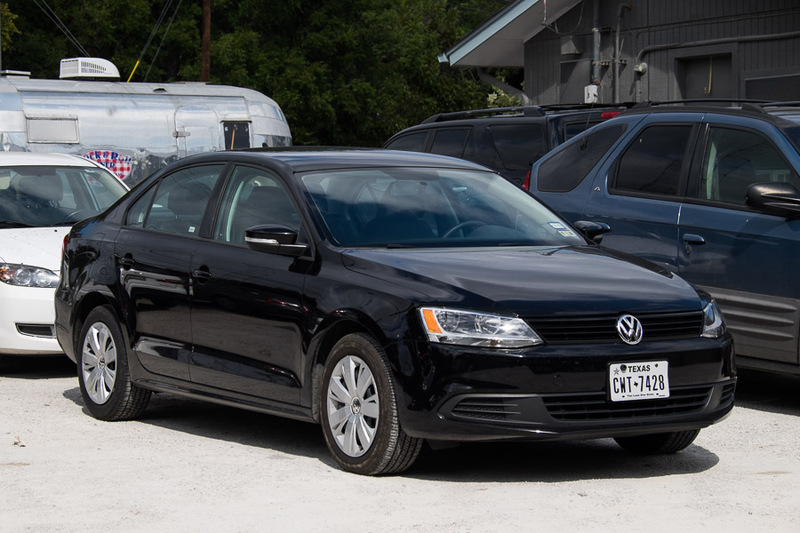 Our rental car in Austin was a shiny new black Volkswagen. Jac had to sheepishly ask the car rental guy how to start the car. Turns out (somewhat counter-intuitively) she had to hold down the brake rather than the accelerator like she’s used to. Once we got going it was fine, Jac driving the car, me driving Google Maps. 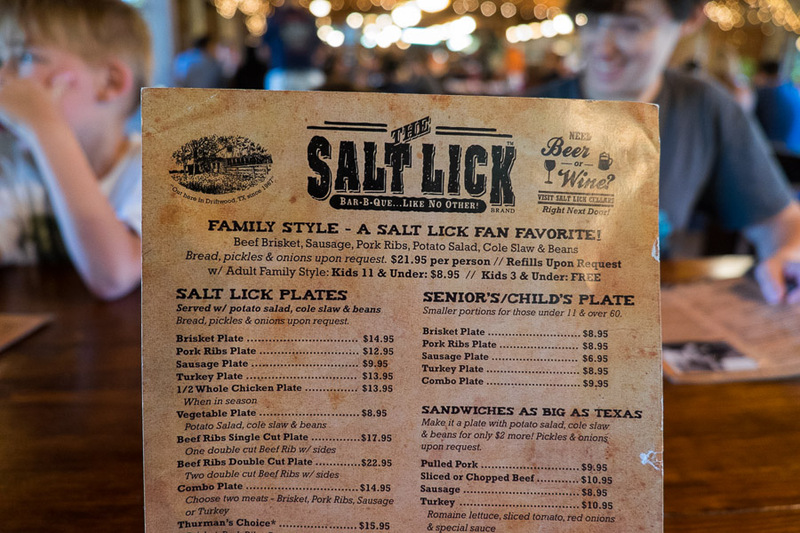 I’ve had The Salt Lick BBQ on my To Eat list for a long time and it did not disappoint. Here, I had one of my favourite meals of the entire trip and of all time. 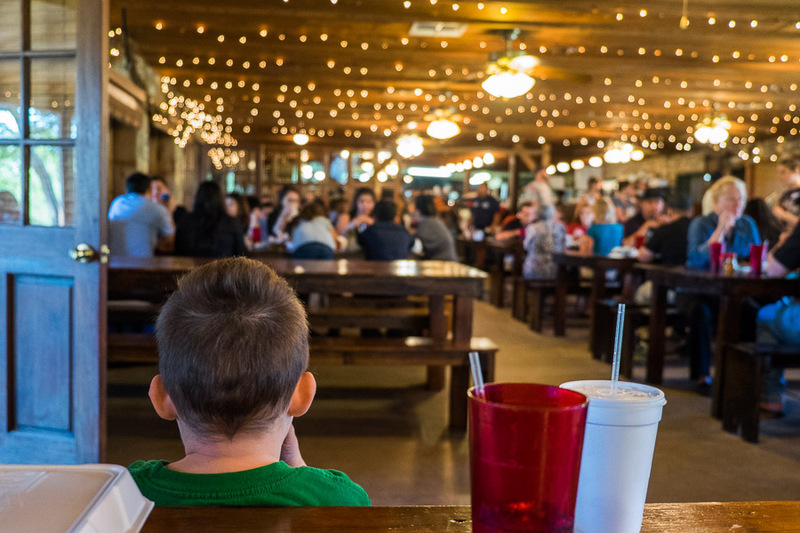 We went for lunch at the original Salt Lick BBQ in Driftwood, home of that legendary BBQ pit. With Melinda, her hubby and kids, we ordered Family Style (US$21.95 per person, kids aged 4 to 11 $8.95, kids 3 and under free), which includes beef brisket, sausage and pork ribs served with sides of potato salad, vinegary coleslaw, beans, bread, and sour pickles – free refills included. 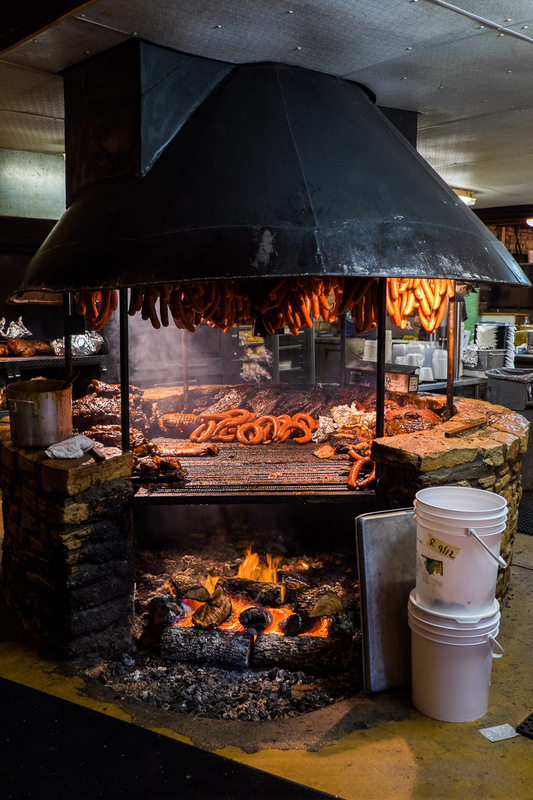 Although cooked slowly on the fire, the meat is kept incredibly moist with repeated basting. 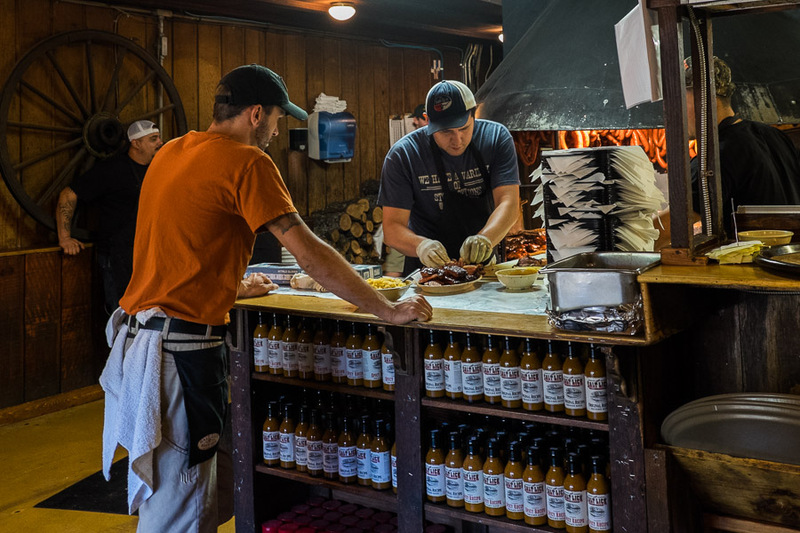 The brisket is cooked 20 to 24 hours, pork ribs 2.5 to 3 hours, and the sausages are smoked for 3 hours with 45 minutes on direct heat until they start to swell and spit juice. As you can imagine, it’s succulent, flavoursome carnivore heaven, best enjoyed without cutlery! Nothing was wasted either – you can take your leftovers home in a takeaway box. 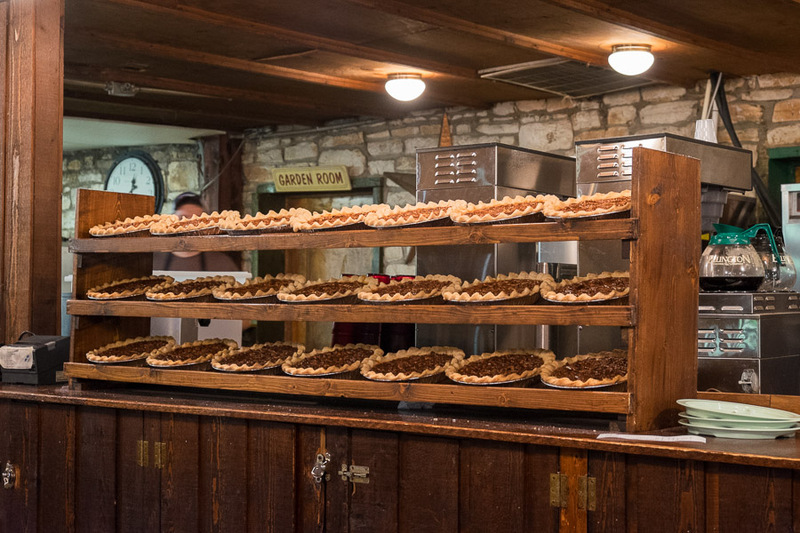 Our family style order arrives – I was bursting with excitement at this point! 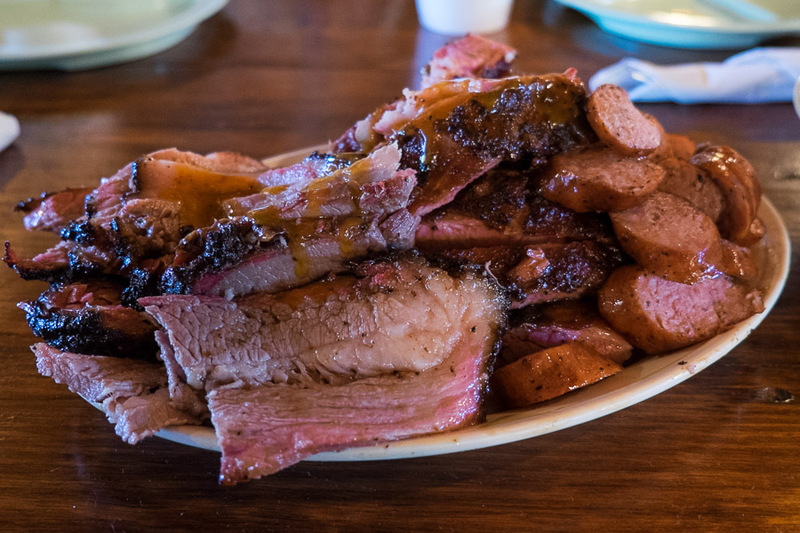 Beef brisket, sausage and pork ribs (yes, we did get a refill of meat!). The brisket had the distinct pink smoke ring just under the blackened crust/bark. A magnificent first meal with our friends. Seriously, it couldn’t be better than this. 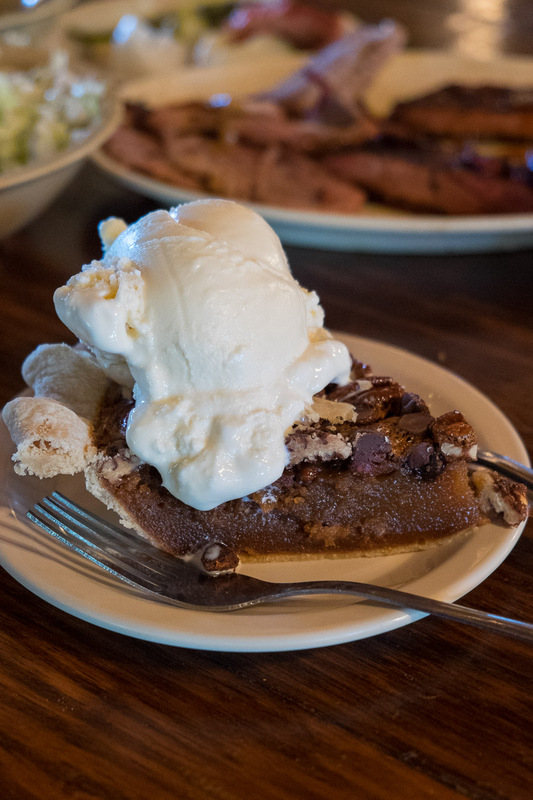 A generous wedge of pecan pie with a big scoop of ice cream. The bench-style seating is perfect for groups. 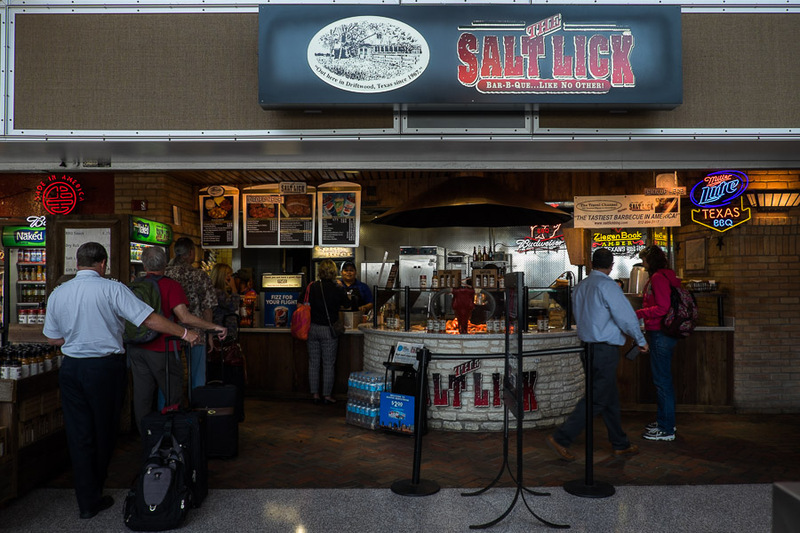 In case you don’t get the chance to go to Salt Lick in Driftwood or at Round Rock, you can get a taste of Salt Lick BBQ past security at Austin International Airport. 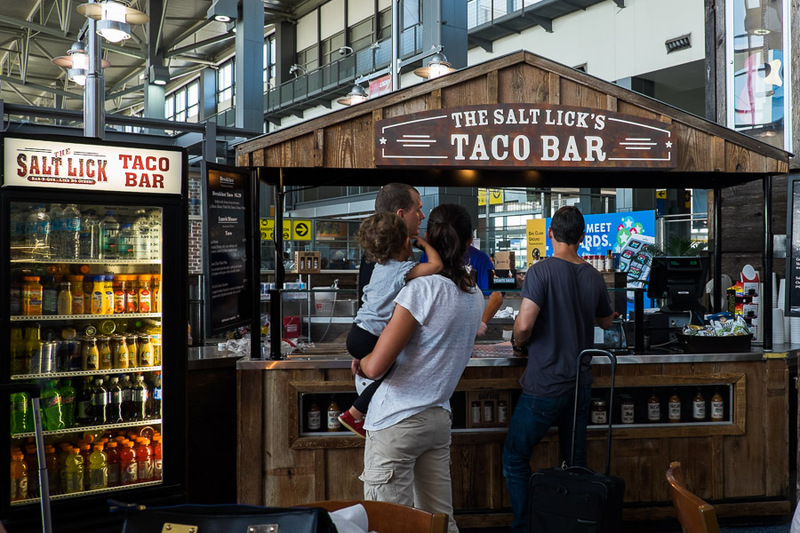 The Salt Lick BBQ is also at Dallas Fort Worth Airport and Oklahoma City Airport. 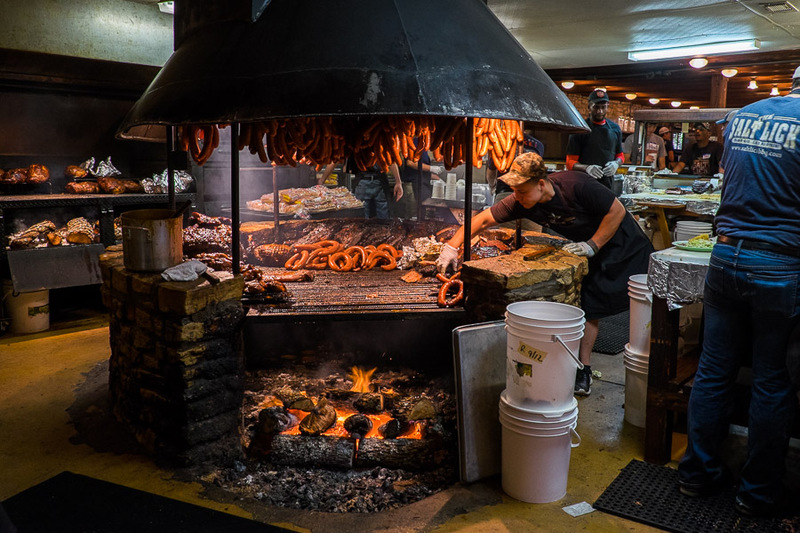 I’d go back to the Salt Lick in a heartbeat. 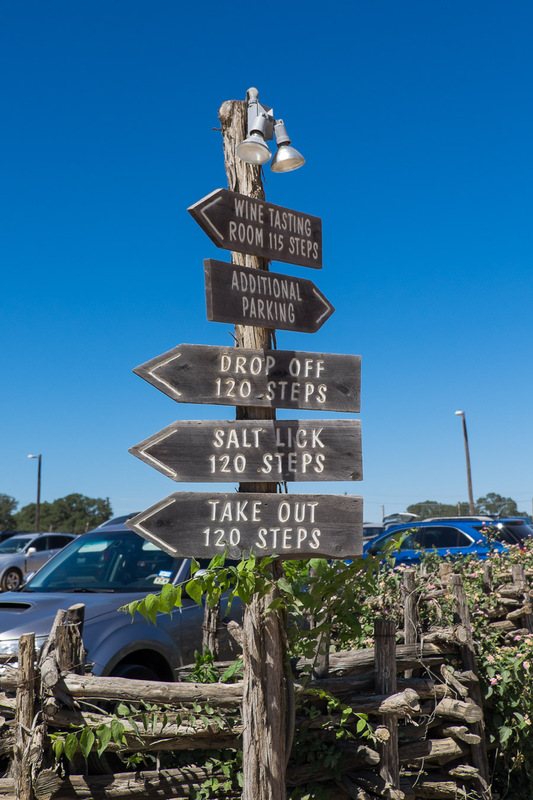 I suppose the Salt Lick set the Texas BBQ bar extremely high for us. 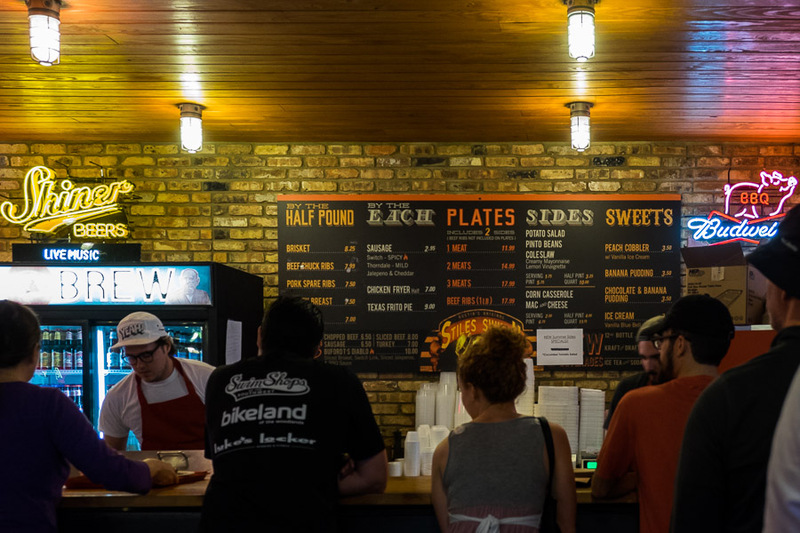 We were keen to try another BBQ place while in Austin. 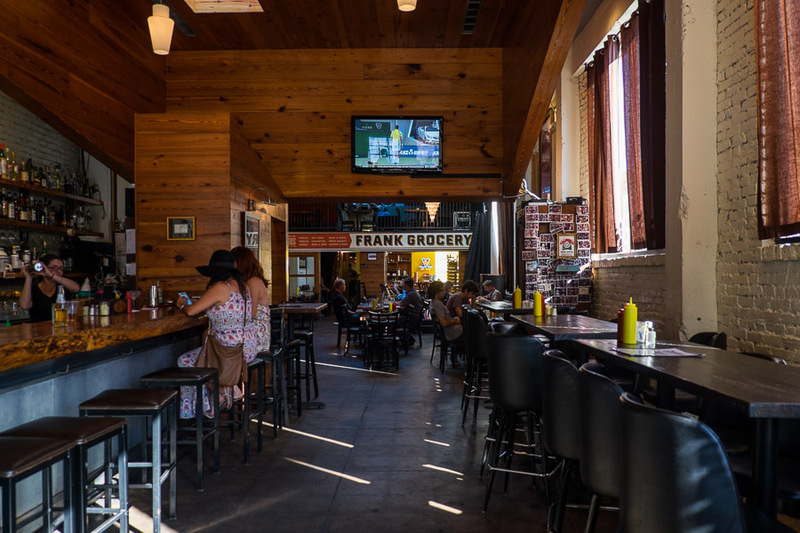 I’d have loved to go to the famous Franklin BBQ but there was no way Jac would consider lining up for 4 or 5 hours. 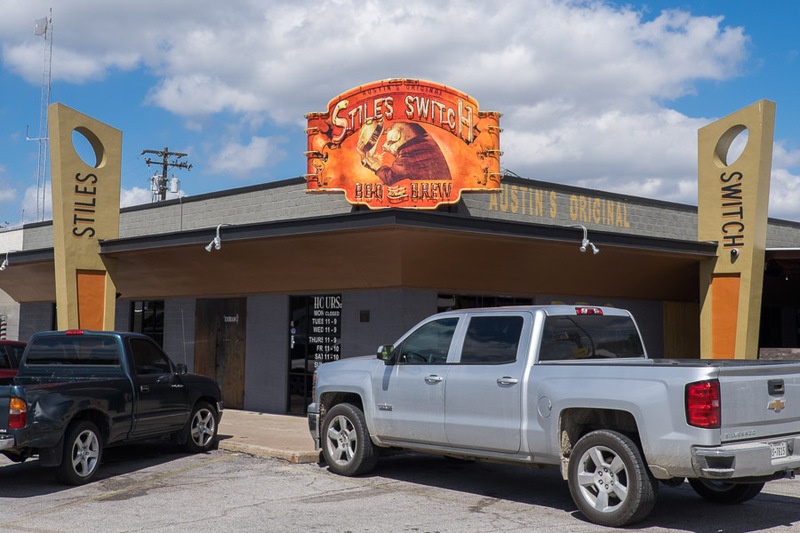 We went for an early lunch at a newer, less hyped place with good online reviews – Stiles Switch BBQ at Violet Crown Shopping Center. 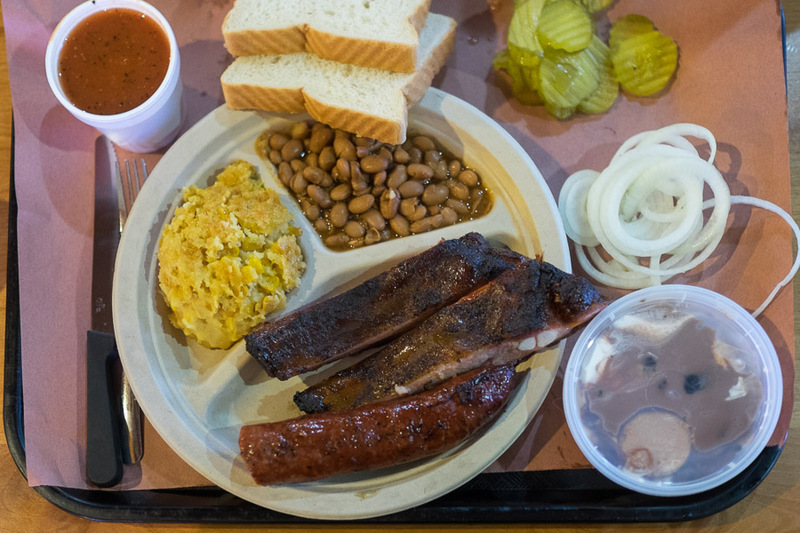 Loved the tender ribs, sausage (we had the Thorndale, their mild sausage) and corn casserole, but my BBQ heart remains Salt Licked. 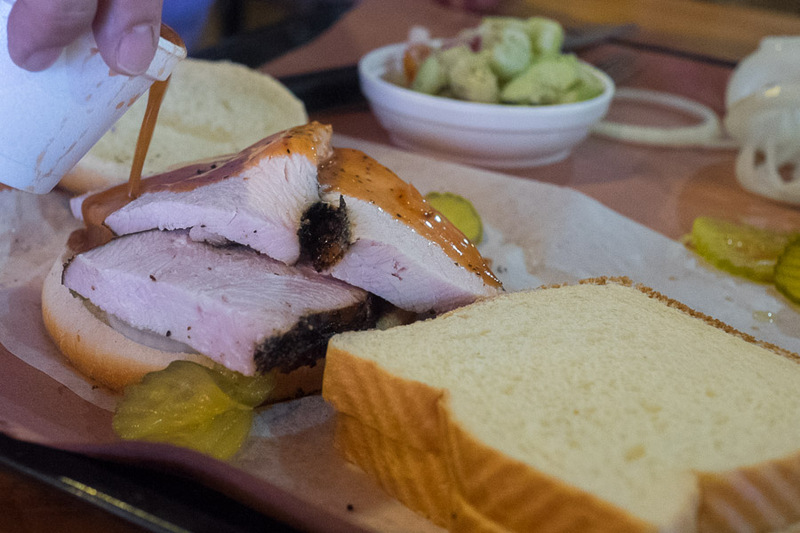 Next time we’re in Texas (and there will be a next time), there’ll be more BBQ joints on the To Eat list. 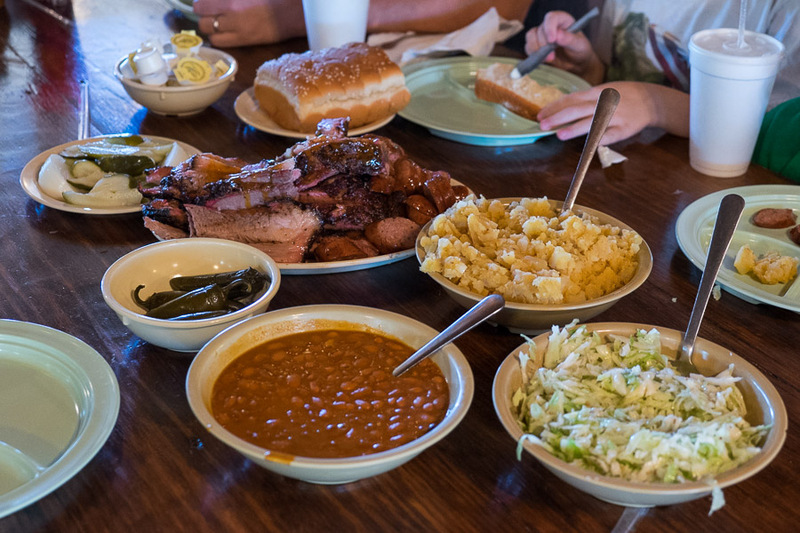 Sausage, ribs, beans with corn casserole and beans, onions, pickles and bread. 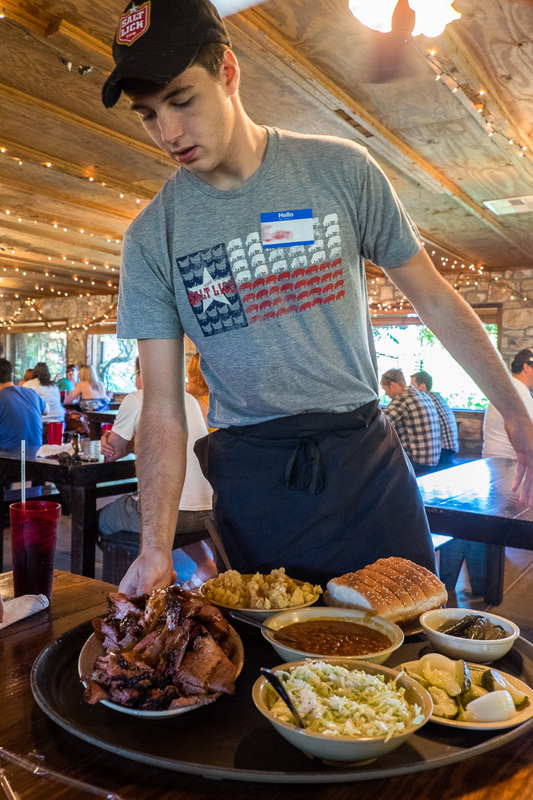 After The Salt Lick BBQ, everything seemed more restrained, leaner and less juicy, but it tasted pretty good. In the container, chocolate and banana pudding, which looked unappealing but was a perfect way to finish. Gourdough’s was another place on my To Eat list – it’s been featured on various cooking/travel TV shows, tempting and torturing me for years. 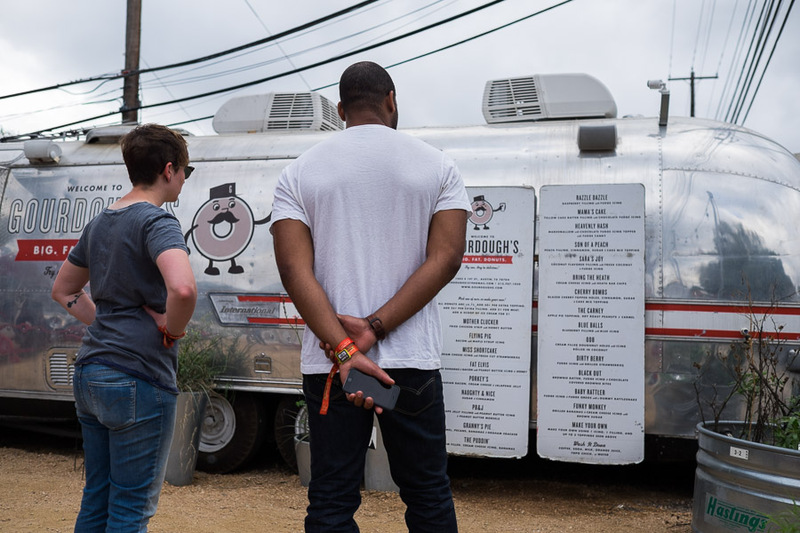 We drove out to the Gourdough’s vintage Airstream trailer at 1503 South 1st Street in suburban Austin for a brunch of doughnuts and root beer. 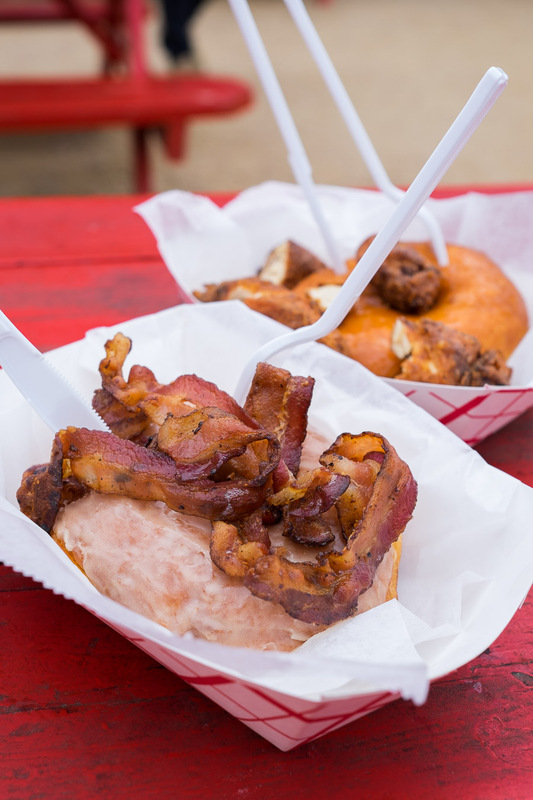 Jac and I shared two doughnuts – the Flying Pig, with bacon and maple icing; and the Mother Clucker, with a fried chicken strip and honey butter. Were they good? Oh yes. 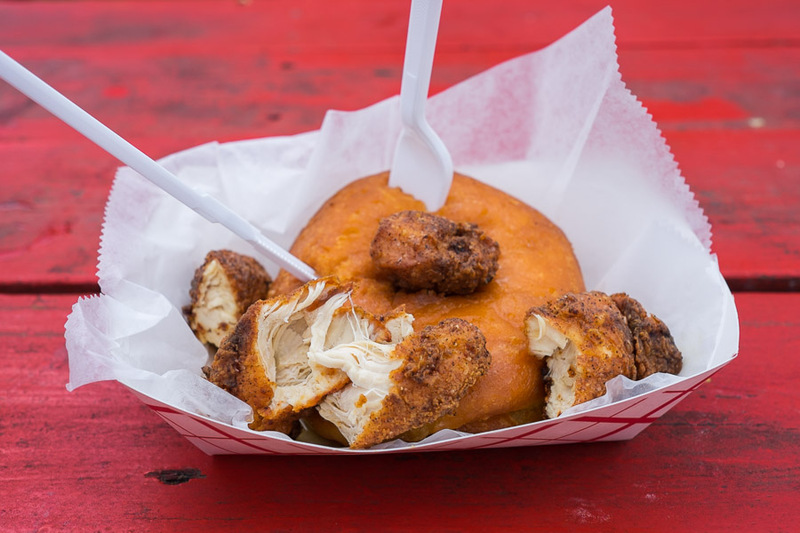 Mother Clucker – fried chicken strip and honey butter. Guess who burned her tongue on the chicken? Hint: it wasn’t Jac. 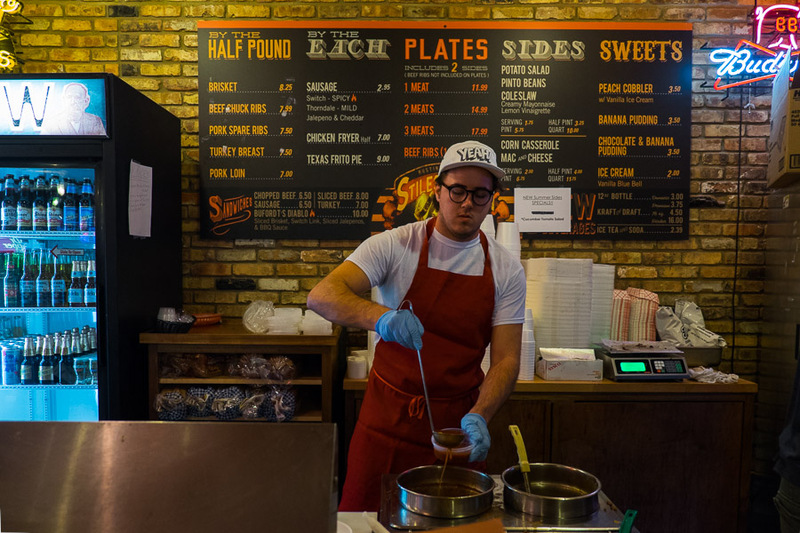 Check out Gourdough’s locations for opening hours and details of the two Gourdough’s Public Houses. 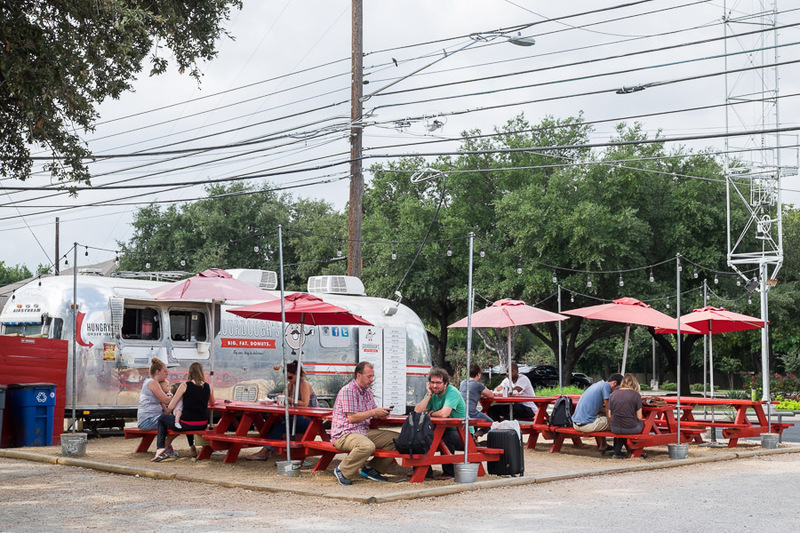 There were other food trailers/trucks at this location, including Mellizoz Tacos and Shawarma Point. Alas, we only had room for doughnuts at the time. 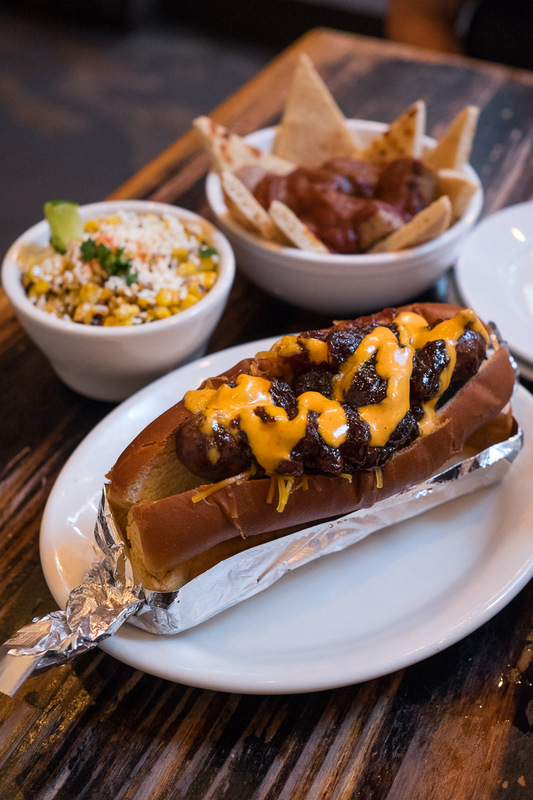 Jackalope (US$9.50) – custom-made smoked antelope, rabbit and pork sausage smothered with cranberry compote, sriracha aioli and cheddar on a Frank bun. I saw ‘currywurst’ on the menu (I love currywurst!) and didn’t really read the rest of the description, so was a little taken aback by the appearance of said currywurst – I guess you’d call it deconstructed; it’s certainly a unique presentation, and definitely not a hotdog. 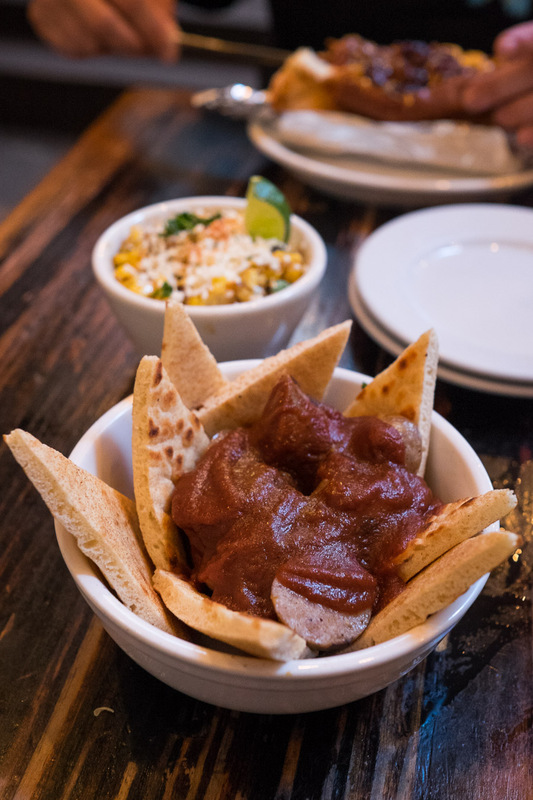 But the sausage and curry BBQ sauce were delicious, and the toasted bread was remarkably tasty smeared liberally in sauce. I’d have preferred a boring old hotdog in a bun, but devoured it all and would eat it again. 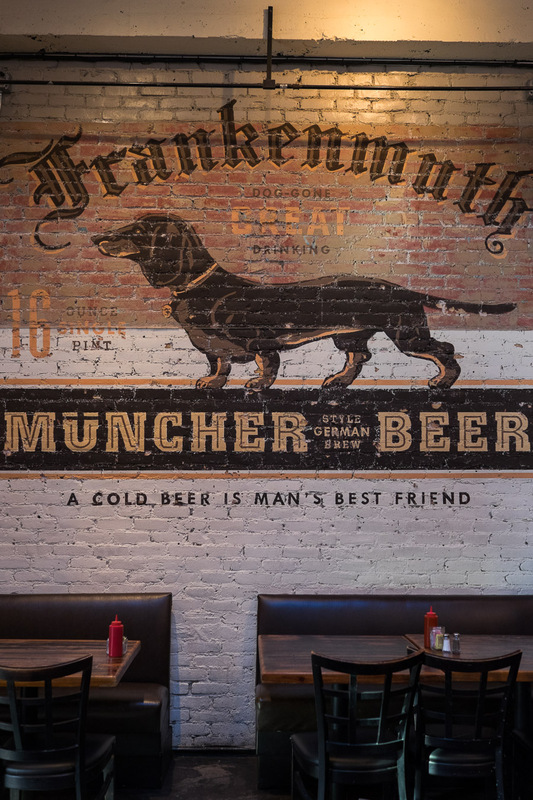 Currywurst (US$7) – smokey local-made sliced bratwurst dressed with curry BBQ sauce and curry powder, served with toasted Frank bun slices. In the background, the Corn Cup. 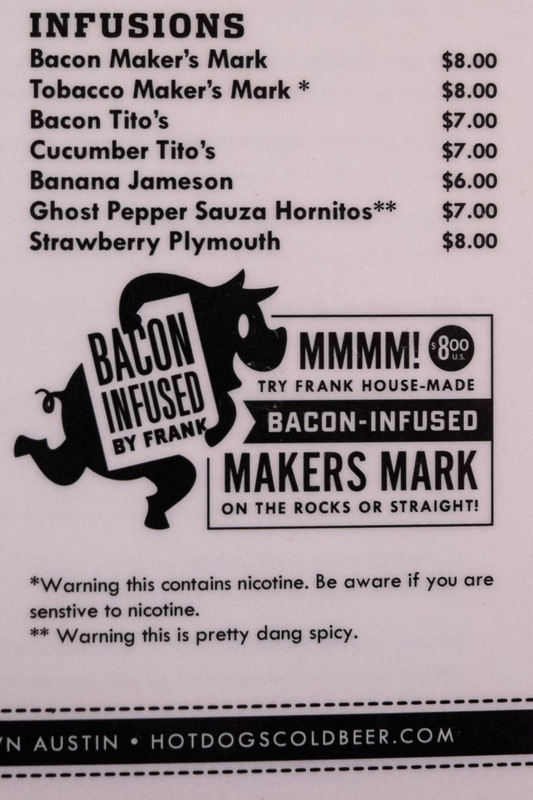 They’ve got some interesting infusion drinks here – Jac tried the Banana Jameson and Bacon Maker’s Mark. 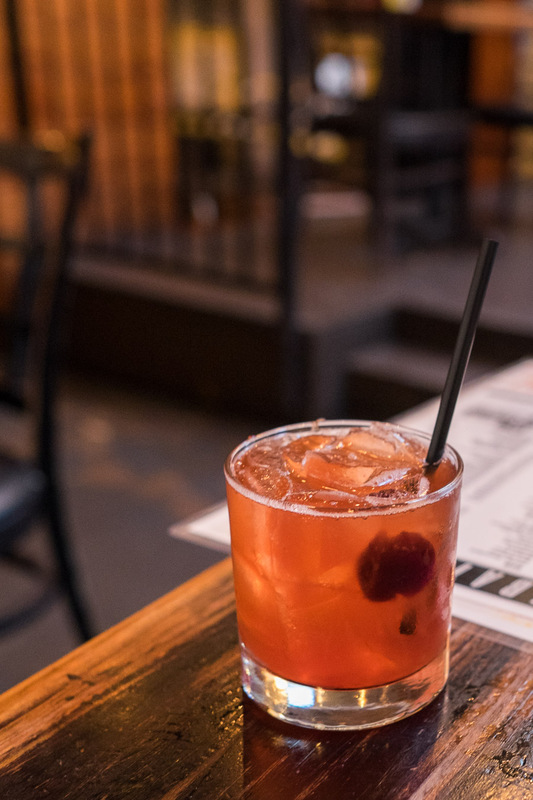 A bit of a gamble, especially on the bacon – sure we love bacon, but as a flavour for bourbon whiskey? We were impressed – both were surprisingly easy drinking! Bacon Maker’s Mark is red, and unsurprisingly, Banana Jameson is yellow. 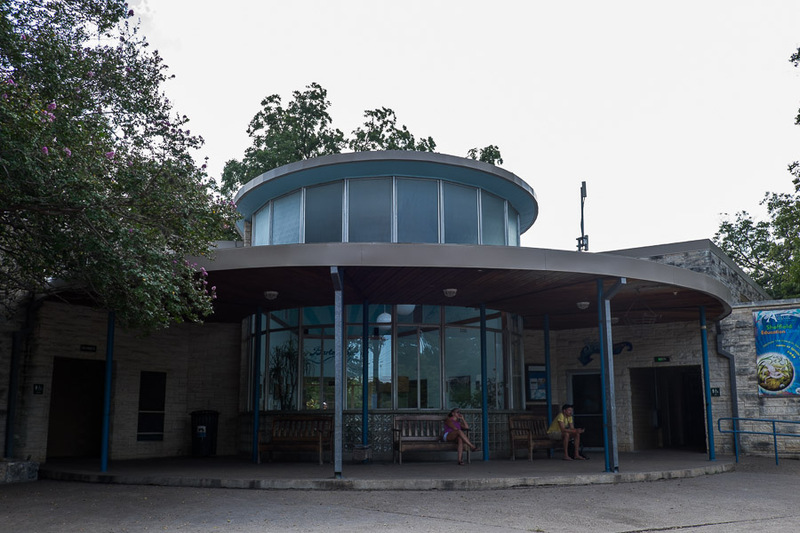 We spent a warm morning at Zilker Park where we rode the Zilker Zephyr (Zilker Park’s miniature train) and dropped by Barton Springs Pool for a swim (well, Jac swam while I kicked off my shoes and chilled out in a cool shady spot on the grass). 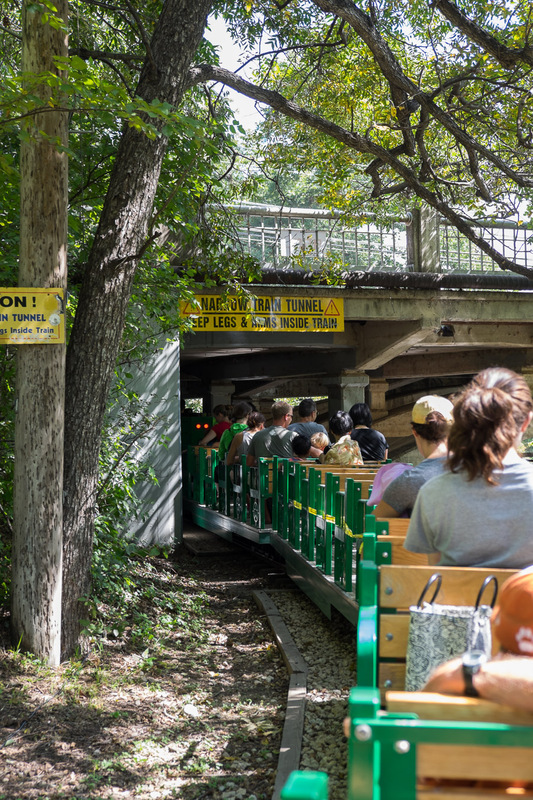 The Zilker Zephyr trundled along at a leisurely pace, taking us on a track winding around Zilker Park, Barton Creek and Lady Bird Lake for ride that took roughly 25 minutes. A hat, sunglasses and sunscreen are highly recommended. 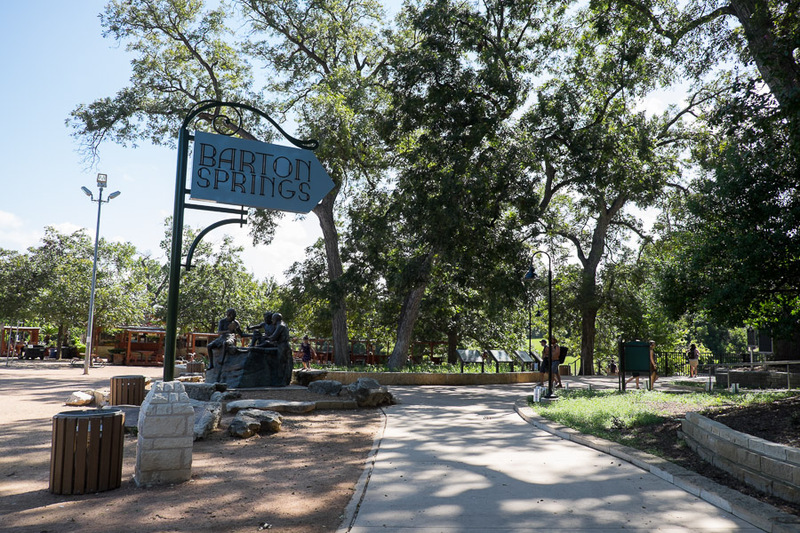 Barton Springs Pool is man-made and fed by a natural spring that keeps the water at a cool 68 degrees Fahrenheit (that’s 20 degrees Celsius). As I sat here in the shade, I rang another internet friend in Virginia and confirmed our pickup details at Richmond Airport in a few days’ time. It’s kind of surreal to hear the voice of someone for the first time after you’ve been interacting online for years. No LOLs, but actual laughter. 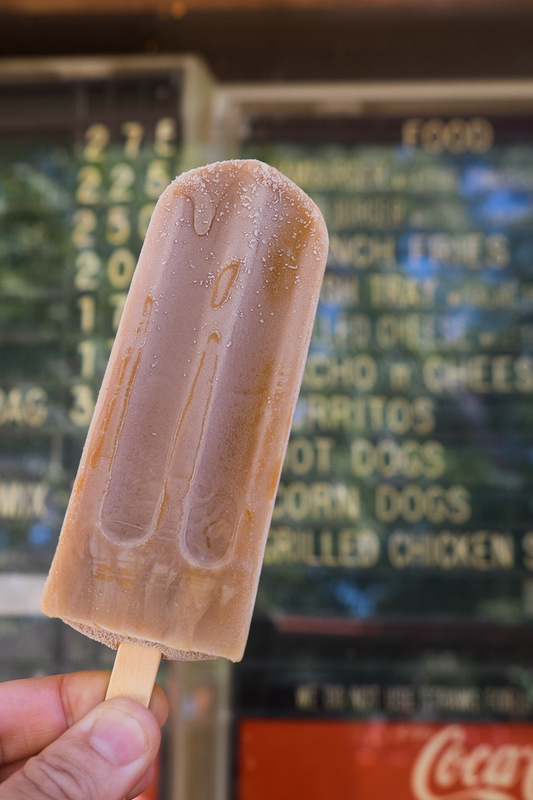 From Zilker Cafe, a cold brew coffee-flavoured Goodpop All Natural Frozen Pop. 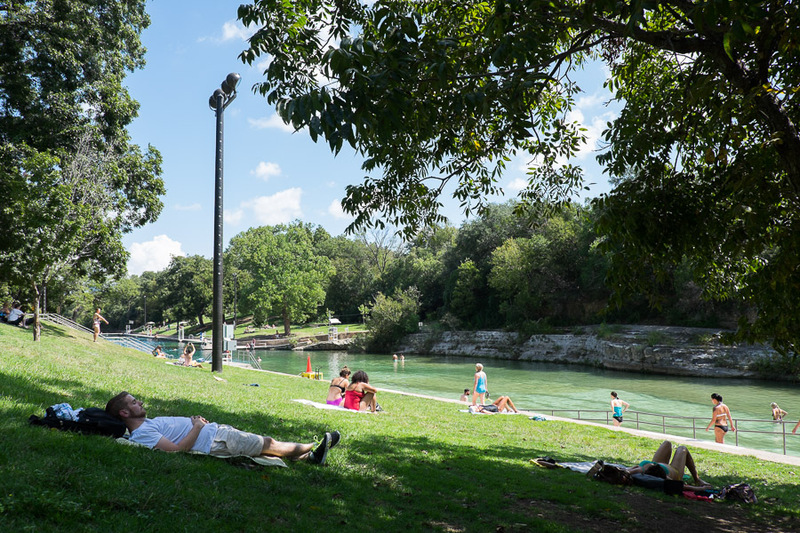 Zilker Park provides the venue for the famous American music festival Austin City Limits. 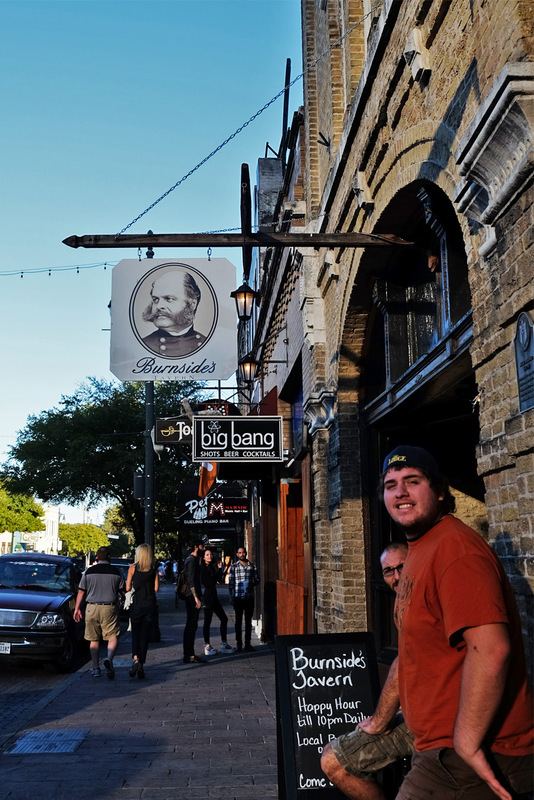 We were in Austin during the first weekend of ACL 2014 but managed to avoid the festival traffic/crowds pretty well. It’s free at certain times – check the website for details. Otherwise, it’s still cheap to get in: Seniors $1; Adult $3; Junior (12-17) $2; ages 11 and under $1. 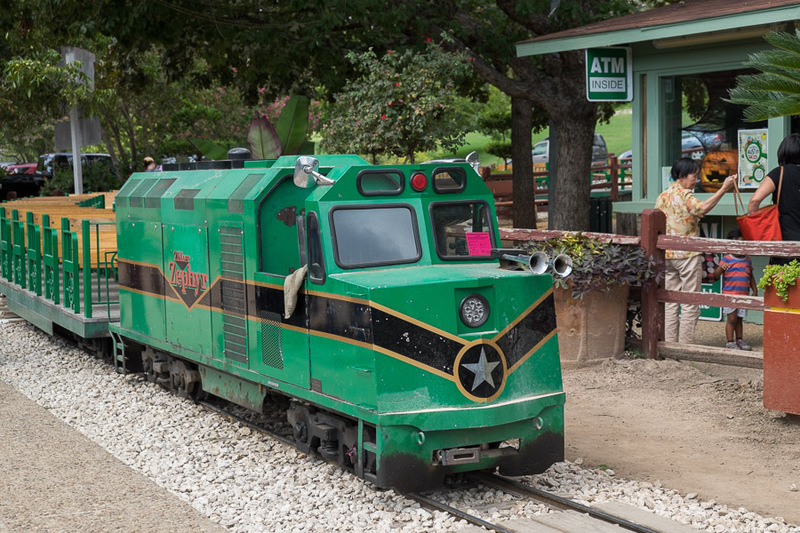 Train departs every hour, payment by cash only. 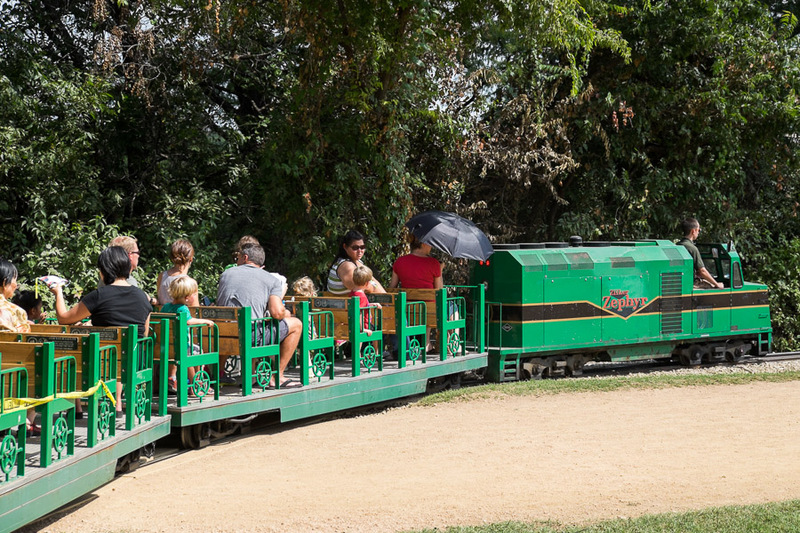 Little (age 1-11) US$2; Big (age 12-54) $3; Well Earned (65 and over) $2; Infants free (under age 1, must sit on guardian’s lap). 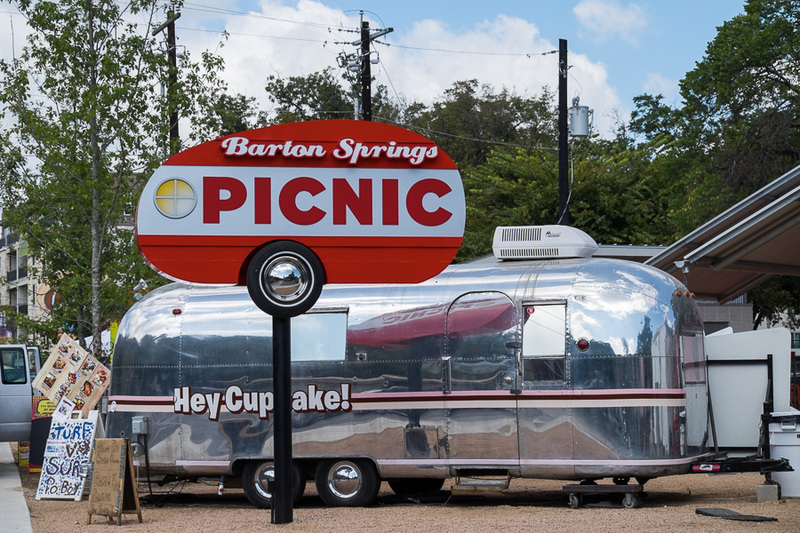 We also stopped at Barton Springs Picnic, a food trailer park on Barton Springs Road, for a cold drink and ice cream. I would’ve tried a Hot & Crunchy Chicken Cone from The Mighty Cone (another item that’s been heavily featured on food TV shows, but they weren’t open at the time. 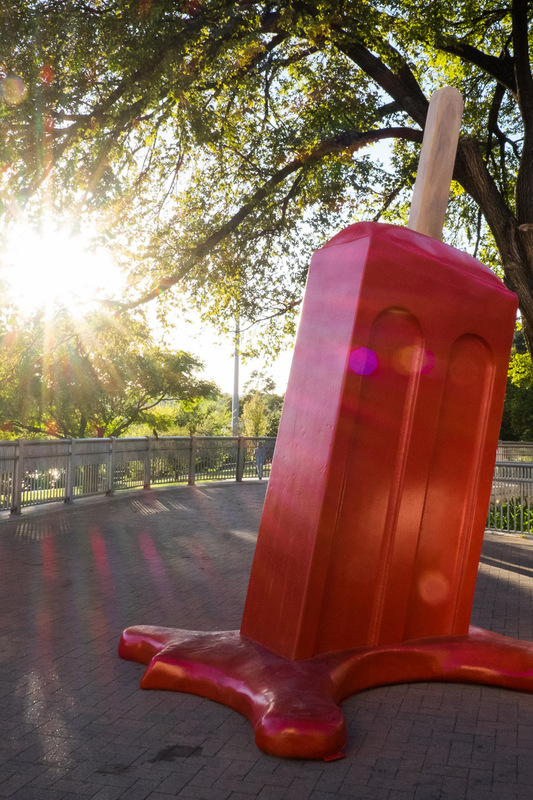 I didn’t just eat a Goodpop popsicle, I also photographed its 15-foot sculpture cousin at the North end of the Congress Avenue Bridge, on the corner of Cesar Chavez in Austin. 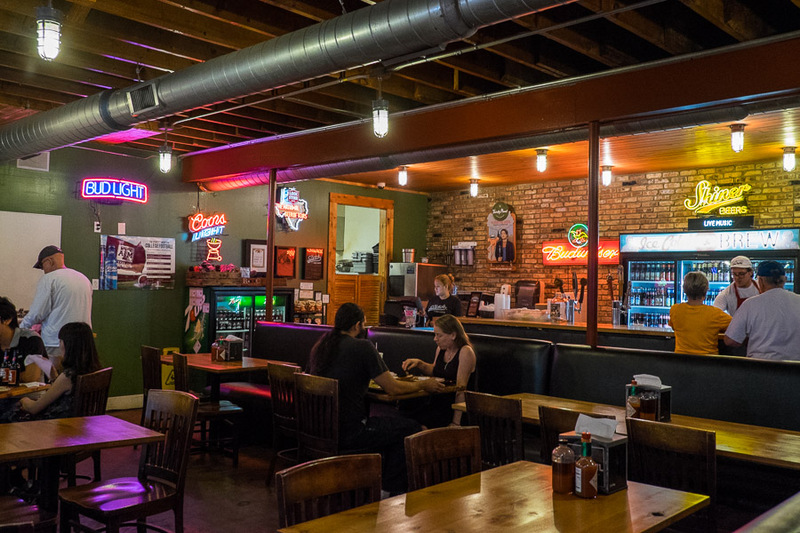 The Bat Bar on 6th Street. 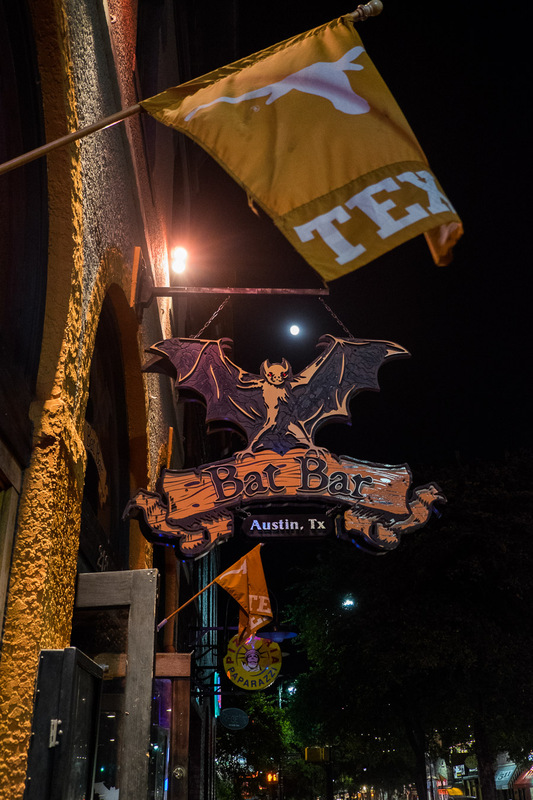 And this is why the bat motif can be seen all over Austin. 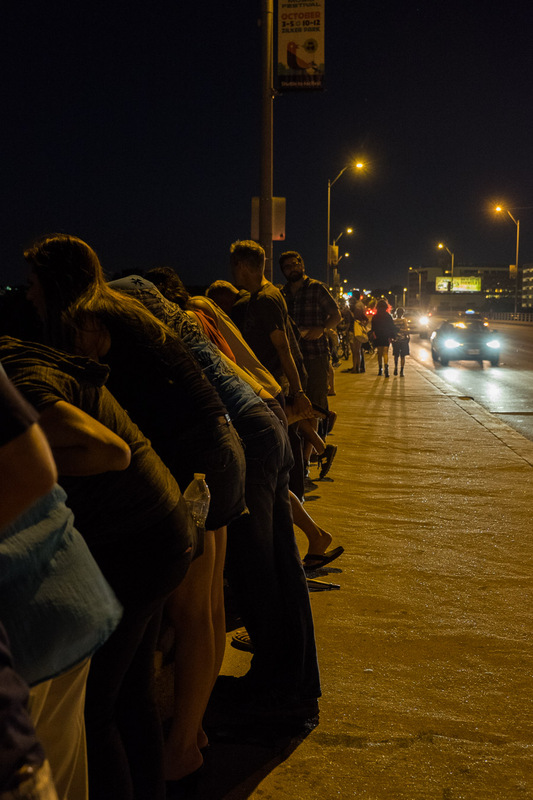 We spent the best part of an evening hanging out with a crowd on Congress Avenue Bridge waiting to see Austin’s bats. 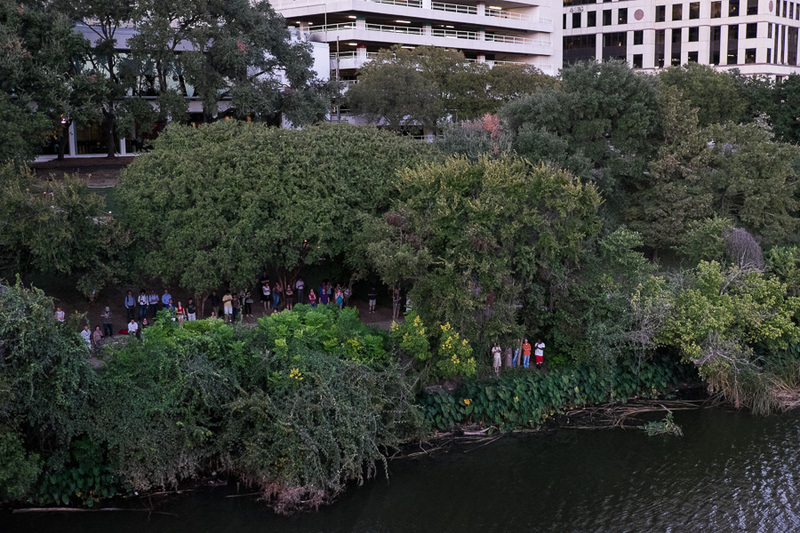 From March to October, if you’re lucky to be there at the right time (research suggested approximately 20 minutes before sunset), you may get to see up to 1.5 million bats emerge from beneath the Congress Avenue Bridge, affectionately referred to as Austin’s Bat Bridge. The bats roost in the crevices underneath the bridge – they are the world’s largest urban bat colony. I must point out, although Jac generally resists queueing for restaurants or waiting around for anything, she was fascinated by the prospect of seeing the bats in flight and showed remarkable, uncharacteristic patience as we waited on the bridge for something to happen. Just when you think you know someone after 19 years, they surprise you: She wouldn’t line up for barbecue, but she waited on a bridge for bats! 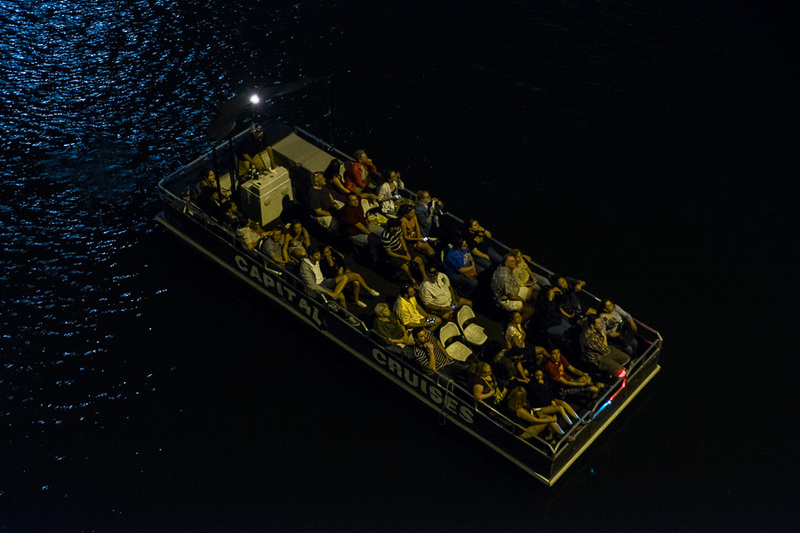 Below us on the river, we saw kayakers and a couple of bat-watching riverboat cruises, and more people waiting along the shore. Alas, on this breezy night in early October, it wasn’t to be. We waited, excitement dwindling, until it would’ve been too dark to see much of anything, let alone take photographs – no mass exodus of bats. A bird flew by and got our hopes up for just a moment, damn it. We wandered back to the shops on 6th Street where Jac bought a “Keep Austin Weird” T-Shirt and I chose a magnet for our fridge to commemorate the occasion. Despite the not seeing the bats, Jac was perfectly happy that we’d been outdoors for a few hours – she enjoyed the people-watching; I was probably a little more frustrated at the time, but it was a memorable experience, anyway. Be warned, it gets crowded on the bridge – you’ll need to get there at least a couple of hours ahead to secure a spot, well before sunset. Congress Street is very busy (both foot and vehicle traffic) and there’s not a lot to do while you wait on the bridge – if we do it again (and I would, only if Jac was keen), I’ll stock up on snacks. I would’ve been less grumpy if I wasn’t hungry. Right next to the bridge, pedicab drivers were waiting to take weary tourists back into town. 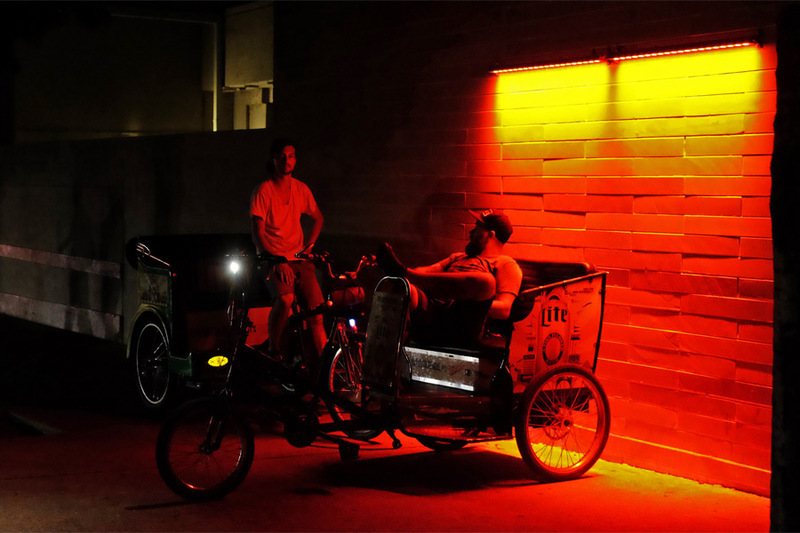 Pedicab services operate throughout downtown, especially around the entertainment district. 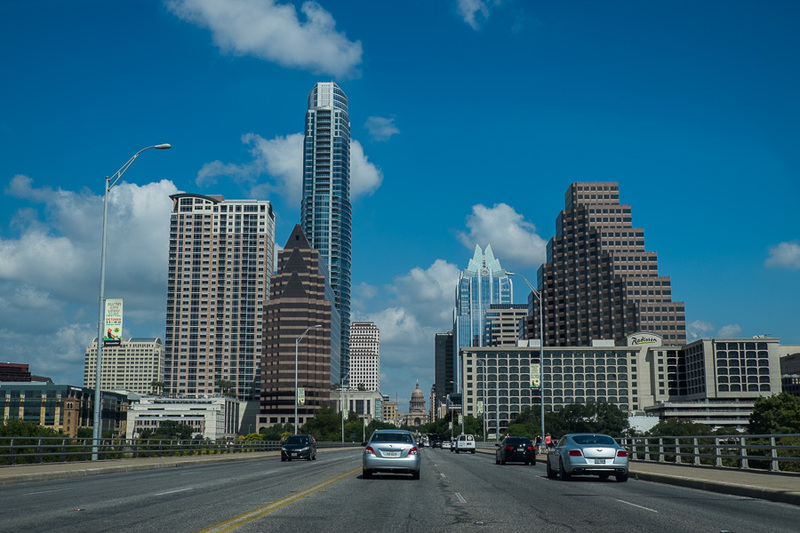 In Austin, we stayed at the Omni Austin Hotel Downtown. 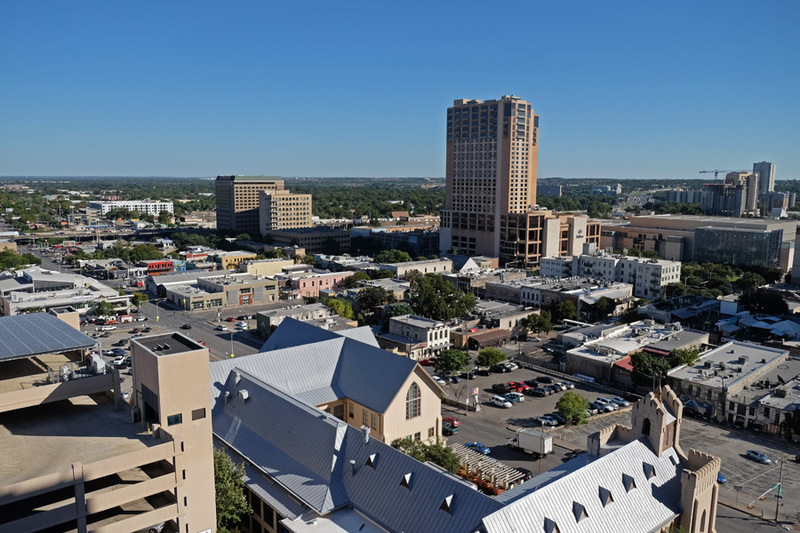 Our room had a balcony with a view of downtown Austin and we were just a block away from the 6th Street entertainment district. 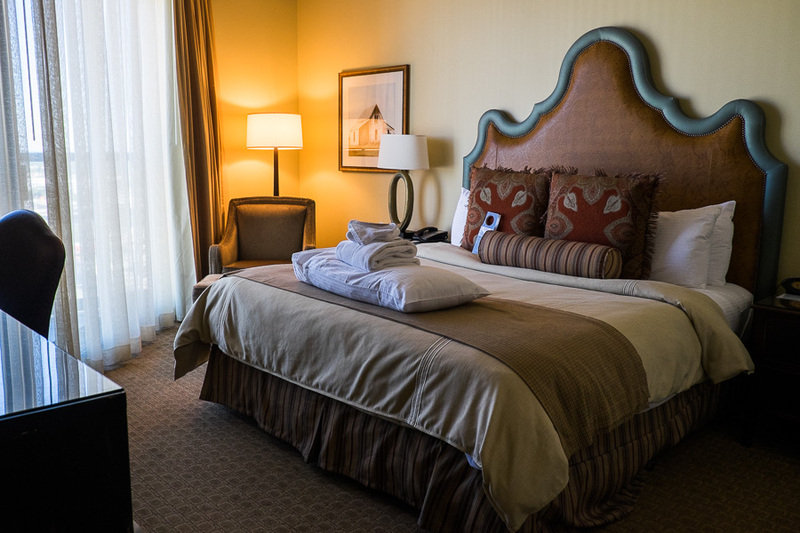 We had a Classic Deluxe Room with King Bed at the Omni Austin Downtown. 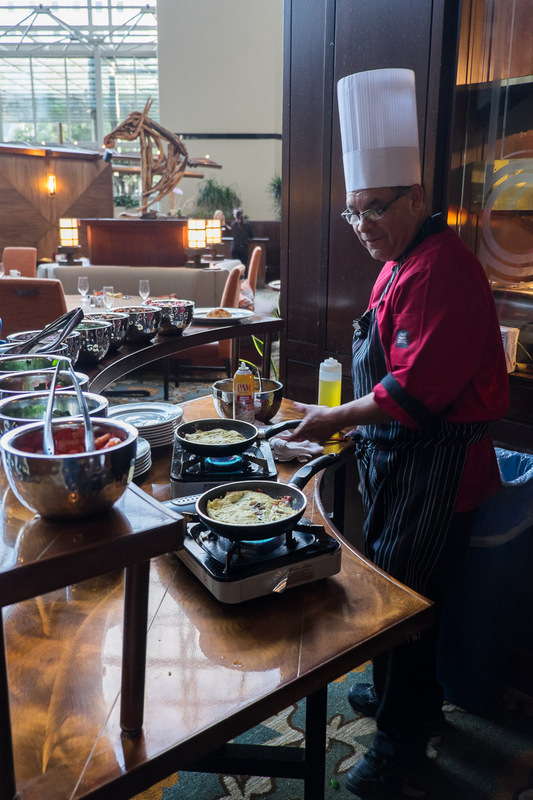 The Omni breakfast buffet at the downstairs restaurant Ancho’s had the standard offerings including an egg station, where I ordered an omelette with ham, tomato and spinach. 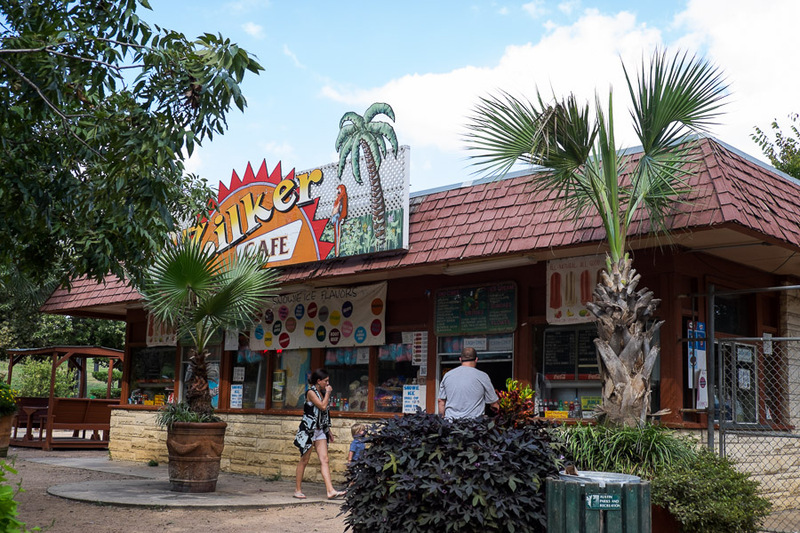 They also have an a la carte breakfast menu (and lunch and dinner). Check in 3pm, check out, 12pm. Free wifi if you join Omni’s loyalty program, Select Guest. 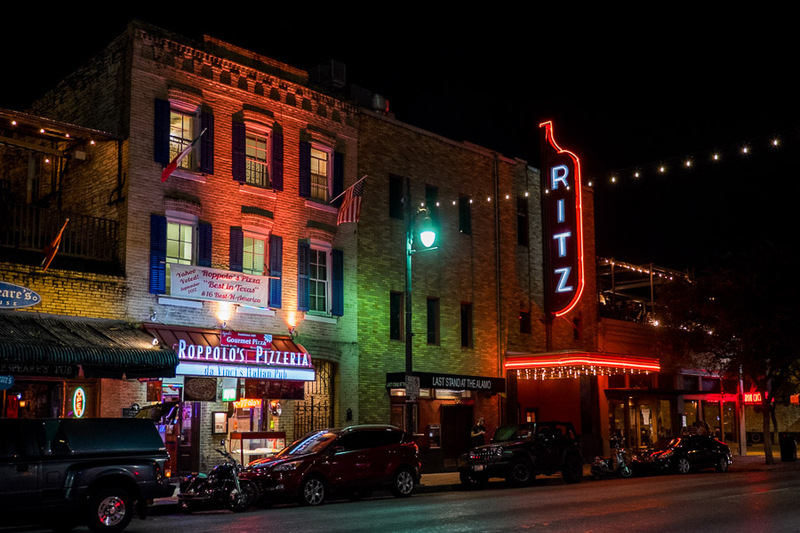 After spending an afternoon with Melinda (which included our first trip to Walmart), we headed back downtown and grabbed dinner at Iron Cactus, a Mexican Restaurant and Tequila Bar on 6th Street. 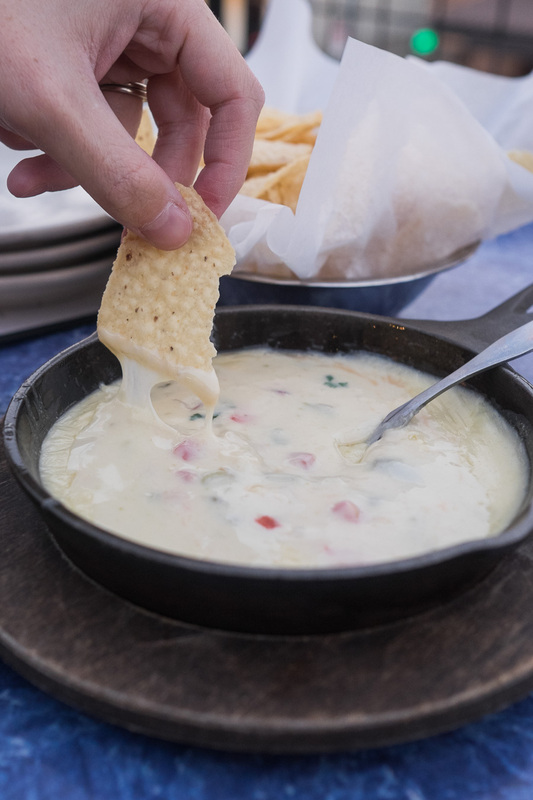 After eating far too many chips dipped in this gooey chile con queso (with hatch green chiles, pico de gallo and roasted jalapeños), it grew too dark for photos. 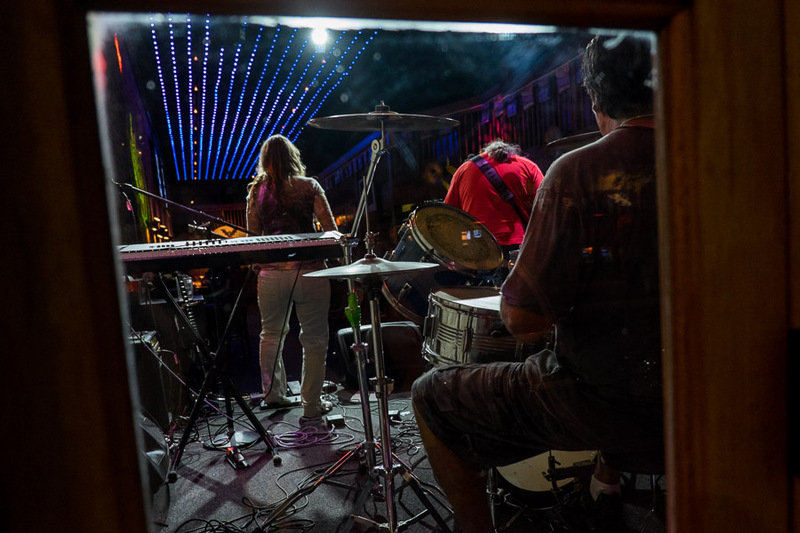 But we had a terrific time upstairs on the rooftop patio. I will catch up on my photo editing and writing from this US trip. There’s still Dallas and Fredericksburg, Virginia. And then there’s more from my Myanmar trip. And later this year, in November, I’ll be back to the United States briefly – en route to Cuba.